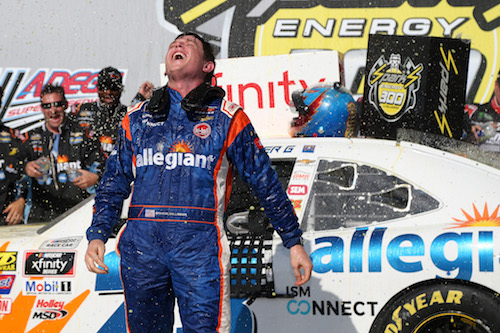 Suspended NASCAR Xfinity Series driver Spencer Gallagher showed up at a series test session at Charlotte Motor Speedway on Monday but was required to leave, as suspended drivers are not allowed to attend NASCAR-sanctioned events, including tests. Gallagher’s indefinite suspension for violation of NASCAR’s substance abuse policy was announced May 2. GMS Racing, for which Gallagher drove the No. 23 Chevrolet in the Xfinity Series until his suspension, didn’t have plans to put Gallagher in the car at the test. Instead, Brennan Poole was at CMS to test the car. According to a NASCAR spokesperson, Gallagher was unaware he would be unable to attend the test as a spectator. He left without incident after being informed he wasn’t allowed in the track’s garage area during the test. The next Xfinity Series race is scheduled for May 26 at Charlotte. GMS Racing has yet to name a driver for that race. Johnny Sauter, who drives a truck for GMS Racing in the NASCAR Camping World Truck Series, raced the No. 23 car in the Xfinity Series race at Dover (Del.) International Speedway on May 5, the only Xfinity Series race, to this point, since Gallagher’s suspension.